Our Coconut Creek podiatrist offer effective treatments! 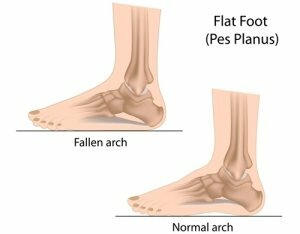 The term “flat feet” is commonly used to describe the condition caused by the flat structure of a foot. Although flat feet is normal for infants and toddlers who have not developed an arch prior to walking, an arch should appear once the child is able to stand on their toes. Development continues into adulthood until a normal arch is formed. The condition of flat feet is often associated with the tendency to lean ankle bones inward toward the center line. When problems occur in the foot, ankle, or lower leg, our Coconut Creek podiatrist can properly assess the condition and determine the appropriate treatment. Tibialis posterior tendonitis, or adult-acquired flatfoot, causes inflammation to the tendon in the tibialis posterior. The condition occurs when the tendon is stretched or torn improperly. If left untreated, you may suffer severe disability and chronic pain. In severe cases, our Coconut Creek foot and ankle surgeon may suggest surgery to repair any torn or damaged tendons. Are you interested in learning more about our treatments for flat feet? Please contact us at (561) 989-9780 to schedule an appointment today.